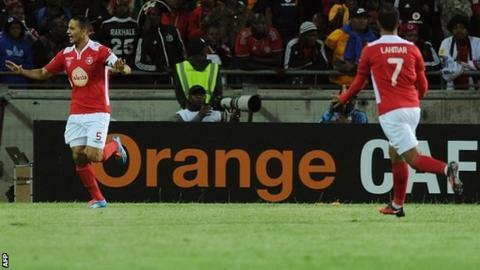 Tunisia's Etoile Du Sahel beat South Africa's Orlando Pirates 1-0 in the second leg of the African Confederation Cup final in Sousse to triumph 2-1 on aggregate. Captain Ammar Jemal scored the winner for the Tunisians to add to his late equaliser in the first leg, which had finished 1-1. Sunday's game was played amid tight security, following Tuesday's bomb attack in Tunis, with a reduced crowd and an earlier kick-off time. Jemal - the 28-year-old centre back, who previously played in the German Bundesliga with FC Cologne and Ajaccio in the French Ligue 1 - emerged as his team's star, as Etoile won Africa's second-biggest club competition. His bundled finish in the 24th minute of Sunday's decider at the Olympic Stadium in Sousse added to his vital equaliser in the final minutes of last Saturday's first leg in Soweto, which cancelled out Thamsanqa Gabuza's strike. Jemal's second goal of the tie came after Pirates defender Happy Jele miscued a cross and the ball spun viciously back towards goal, with the centre-half managing to bundle the ball over the line. Originally scheduled for an 1830 GMT kick-off, the last major match of the African continental club season was brought forward by four-and-a-half hours. And the initial crowd limit of 20,000 in the 25,000-seat stadium was halved to 10,000 on the orders of Tunisian authorities. Pirates were already familiar with Tunisian teams, beating CS Sfaxien 1-0 in a Confederation Cup group game in Sfax four months ago. But that did not help in the two-legged final, as Jemal - deputising as captain for injured goalkeeper Aymen Mathlouthi - inspired Etoile to claim a ninth African title. It is also the fifth Tunisian success in 12 finals of the African equivalent of the Europa League, with Sfaxien having triumphed a record three times. In addition, it marks Etoile's first continental title since the 2008 Super Cup as well as coach Faouzi Benzarti's third African club title. Pirates were hoping to end a 14-year African trophy drought by South African clubs, but that wait goes on, with the 1995 African Cup of Champions Clubs (now African Champions League) and the 1996 Super Cup marking their last continental triumphs. Etoile pocket $660,000 (625,000 euros) and secure a Super Cup date with Champions League title-holders TP Mazembe in Democratic Republic of Congo city Lubumbashi.